Alabama President Dr. Robert E. Witt headlines the special guests who will be in attendance for this year's party. Join us for the 2011 Greater New York Chapter Holiday Party on Monday, December 5 beginning at 6 p.m. at the Silverleaf Tavern. Located amid historic brownstones on the corner of East 38th Street and Park Avenue South, the Silverleaf Tavern is in New York's residential Murray Hill district in the heart of midtown Manhattan. New for this year's event, the chapter will be hosting a free open bar from 6-7 p.m.
A highlight of the chapter's event schedule, the annual holiday party offers a wonderful opportunity to discover old friends and make new ones with Alabama alumni in the New York City area and show some good ol' southern hospitality to VIP guests and dignitaries from the senior administration of the University and the athletics department. The chapter is very excited to announce a very special guest for this year's event. 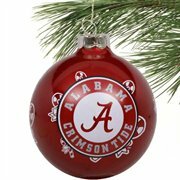 President Dr. Robert E. Witt has confirmed his attendance so let's give Dr. Witt and all our special guests a big UANYC welcome as we celebrate the holidays with our Alabama friends and family. UANYC has a selection of silent auction items available for online pre-bids prior to the event. Click here for bid information and item descriptions and photos.